The best way to enjoy the cozy comfort and warmth of your premises is by keeping its attic and crawl spaces clean and well maintained. Quartz Solutions services include Attic cleaning, attic insulation (Repair and Replacement), attic decontamination, radiant barrier, air duct repair, replacement and cleaning, crawl space cleaning, crawl space vapor barrier, crawl space floor insulation, crawl space insulation, rodent proofing & rodent control and more. Did it sound unintelligent and inexperienced? But pay heed to every word or else the damage and devastation will rob you off a peaceful living. Neglected attic and crawl spaces attract a wide range of troubles. Seeping water, leaking gases, broken vents and ducts, critters making their way into the dark, dreary spaces; the list can get endless. Failure to attend to these problems on priority may end up in fiasco. Periodic inspection and maintenance of the spaces is thus crucial. And Quartz Solutions is second to none in the business. Our expert crew, novel techniques and easy on pocket custom plans make us a cut above the average. Numerous infestations lurk in our attic and crawl spaces. Dust, odors, moisture, critters – all may appear innocuous. But their quick and uncontrolled breeding may pose serious threat to property and health. Leaking ducts allow water and moisture to seep in. Moist conditions are ideal for mold, mildew and fungus to thrive and flourish. Their presence can rot wood, suffocate interiors and fuel serious allergies and breathing troubles. Insects like spiders, wasps, ants, and roaches leave a trail of germs making the area infectious. 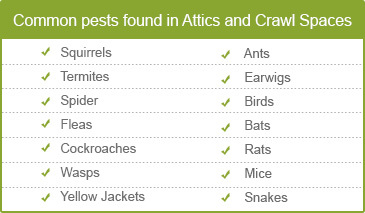 Animals like squirrels, raccoons, mice and bats settle in dull and damp attics. They eat into ducts, vents, insulation wires and cables and your favorite upholstery. They make the areas messy and leave behind a trail of infections. Pests, termites and carpenter ants damage the wood panels, beams and furniture. They weaken the structural integrity and require costly repairs. Defunct insulation system distorts the temperature control mechanism rendering the interiors extremely hot or cold and increasing utility bills manifold. A thorough assessment and examination of the attic and crawl space goes a long way in making the property safe, clean and comfortable. A close analysis of the area that to by professionals is important as numerous clues often go unnoticed by laymen. And Quartz Solutions is best equipped to do the job! Our professional crew is well versed with the latest techniques in the business. We offer a complete line of services that can handle all attic and crawl space needs in the most effective way. Critters, cracked and broken ducts, leaking gases, impaired ventilation ducts and pipes; we will resolve every issue in the most meticulous manner. Rest assured, our customised plans are reasonably priced and easy on pocket. Attic insulation removal: Just like the insulation installed in the walls and floor of your home or building, attic insulation can keep you warm in the winter, cool in summer, and save you money all year round. We’ll remove the contaminated or old insulation, clean the space and replace it with new. 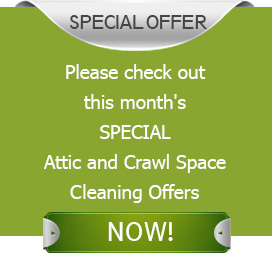 Crawl space cleaning: A clean crawl space means a healthy living space. Dust, mold and mildew can grow where moisture resides, and if you don’t regularly clean your crawl space, your family members might be breathing tainted air, as most of the air flowing to the first and second floors of your home comes from the crawl space. Rodent proofing and control: Everyone knows the dangers posed by rodents and other animals that want to make your home theirs. Regular maintenance and active prevention is the key to keeping these pests out of your property. Air duct cleaning: HVAC ducts accumulate contaminants. If not cleaned regularly, that buildup can cause countless problems. Dust, mold, bacteria and fungi can affect the quality of indoor air, and may pose a health hazard such as allergies, diseases, etc. Attic decontamination:Animals leave a host of microbe-rich material that can cause disease and physical damage. Attic decontamination and pest proofing is a wise investment for any homeowner. Removal of dead animals:Removal of animal remains is crucial as the carcasses themselves produce foul odors; contaminate the space and especially the insulation material. They should be removed ASAP in order to prevent further damage that can be very costly. Air Duct Repair and Replacement: Air duct systems draw stale air out, and push temperature-controlled, filtered air in. New or old, well-maintained air ducts filter and funnel large quantities of dust. Keeping systems free from extensive dust buildup. Crawl Space Vapor Barrier:Excessive moisture is a primary cause for crawl space problems. Potential damage can be prevented by following 4 steps: Installing a vapor barrier, removing existing rot, keeping the space dry and implementing preservation methods. Crawl Space Floor Insulation:The crawl space can have a great impact on your home’s energy efficiency. insulating the ceiling of a ventilated crawl space, or other area exposed to the outside, can go a long way toward keeping inhabitants more comfortable, and saving on heating bills. Crawl Space Insulation: Many homes and buildings were constructed without crawl space insulation, especially before 1990. By properly sealing this hidden, often forgotten area of your home, you can help the environment, be more comfortable, and save hundreds of dollars on energy costs. Attic Radiant Barrier Installation:Radiant barriers minimize heat transfer, they also prevent dust accumulation on reflective surfaces, which reduces the buildup of harmful microbes and preserves energy. Our committed and competitive approach makes us a class apart. At Quartz Solutions, we offer customized services that fit into the needs and budget of every client we serve. South Hackensack, a small township in Bergen County NJ, is home to less than 2,500 people. Situated on the banks of the River Hackensack, the town offers vibrant views and serene surroundings. Let no infestation tarnish the image of the town. Hire us to help you keep your property and premises in effective and comfortable conditions for years to come. Let us be your only choice to keep your attic and crawl spaces in top-notch condition. Look no further! Call us at 201-205-2042 and schedule your free inspection, now! Your email address will not be published or shared. Required fields are marked with an asterisk (*). © 2018 Quartz Solutions. All rights reserved.